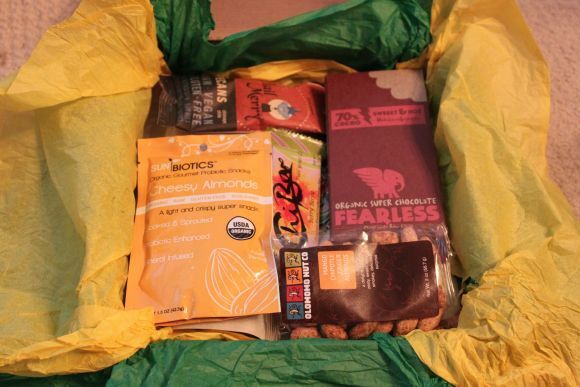 Beautiful Incentives: Healthy Surprise Review & Giveaway! 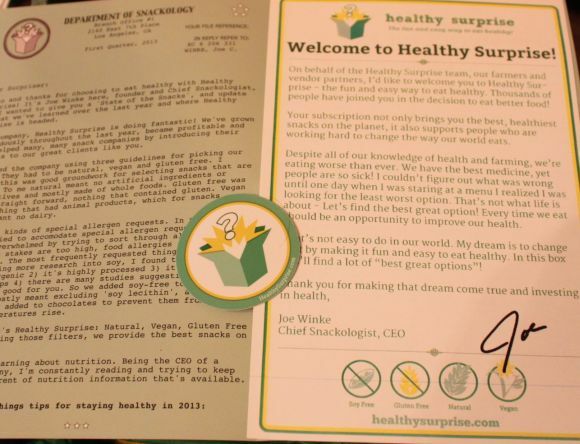 Healthy Surprise Review & Giveaway! I get so excited when I find a really good foodie subscription box that meets all my needs. As you know, it can get very expensive trying out new foods that you may end up not liking. Healthy Surprise is another outstanding box that takes the guessing game of "Will I like this...Do I really want to spend the money?" out of the equation. You no longer have to gamble on the health foods you buy because you can sample them at a much cheaper cost! Healthy Surprise is one of my favorites. It is a special one, as the only things offered in this are gluten free, all natural, soy free and vegan friendly. They choose everything carefully to meet the strictest of people's diets. This is an excellent way to discover new foods your kids or you will not have allergies to. The Department of Snackology has all your foodie health needs covered. I received an array of generous sized healthy foods to try out. Most were 1 or 2 servings and the rest fed more. For $33 a month, you really get a good amount of things, as specialty vegan and gluten free products tend to be expensive! You can also order more for a higher cost. Up to $90, depending on your needs. I loved almost everything, but one thing you see in the picture below and that was the third bag in the second row. They are cheesy almonds by Sunbiotics. There was something off about the taste that I just can't explain, but It has to do with the biotics added to them i'm assuming. Something in the powdered cheese they used. Otherwise, these were all so tasty. 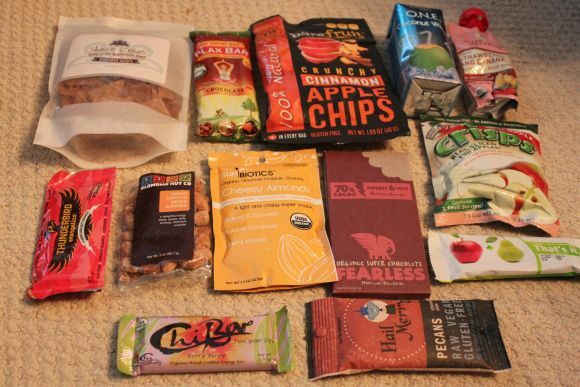 My favorites would have to be the Hail Merry pecans, Brother's All natural fruit crisps, O.N.E coconut water, "That's It" fruit bar, Skinny Crisps cinnamon crisps, Bare fruit apple cinnamon chips and Fearless chocolate, which had a slightly spicy kick to it that I liked, a unique taste. I'd give them A+ on effort and creativity. They did their homework scoping out the best brands to add to their boxe. I can't say the same for all these kinds of boxes. I think this is by far the one with the most for the money. Some come close, but this one wins. I wish I had taken pics of the box, but I was in a hurry to get everything out the door, as at the time I had no walk way! It is cute. It says things like "Let's be friends" "Deliver this awesomeness to such and such" and even a thank you to the mail man who delivers it. What's also awesome about the box is that the top rips off and you can covert it into something else, upcycle it into something new or recycle for someone else to! I think Healthy Surprise really stands out among all the other health food subscription boxes and I can see them going far! If you'd like to learn more, visit them on Facebook ! I was provided with this product for the purpose of review and was not compensated for my contribution. My opinion may differ from yours. This box looks like it has a nice selection.